One way to celebrate summer is by getting beachy hair. But how do you do that? By creating beachy waves in your hair, using a curling iron. Check out our reviews of the best curling iron for beachy waves and choose the one that seems right for you. To get beachy waves, you need a wide barrel. The best curling iron for beachy waves will have at least a 1-inch barrel, although 1.25-inch is usually ideal. Each of the curling irons we reviewed had a barrel that was at least 1-inch. The exception was the Deep Waver from Bed Head, which works by crimping the hair. If you have trouble with typical curling irons, it can be worth trying out. We didn’t review any stainless steel or metal curling irons, as we believe it’s very important for a curling iron to have some sort of coating. Each iron has a ceramic coating, although some, such as the Remington model, claims to be a bit better than basic ceramic. 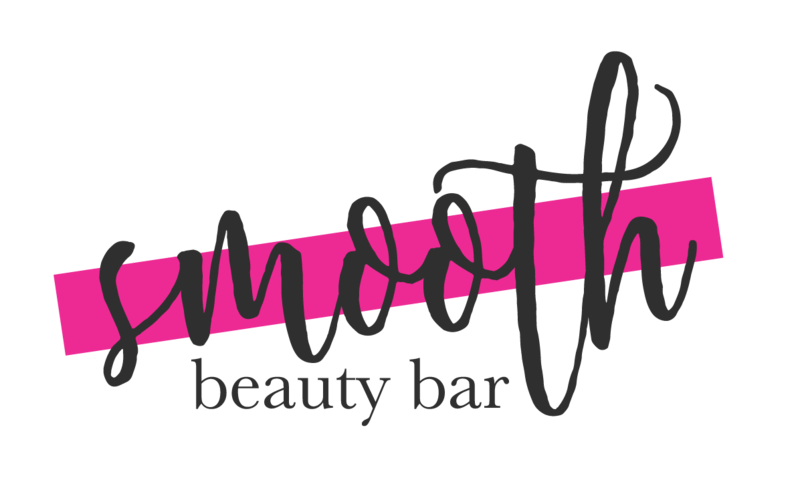 According to Today, the Beachwaver Curling Iron is the tool stylists use to help Victoria’s Secret Angels get their beachy waves for the big fashion show and photo shoots. So if your dream is to look like a VS model, this is the tool to use. What sets the Beachwaver apart from other curling irons is that it’s a self-rotating iron (the first of its kind). The iron was designed by a celebrity stylist, Sarah Potempa. The S1 curling iron model is designed for use by regular people (there’s a pro model, but it’s less well liked by your average person). The iron has a ceramic coated, 1-inch barrel and heat settings from 290 to 410 degrees Fahrenheit. You can adjust the rotation of the curling iron as well. People who have used the Beachwaver S1 are pretty pleased with it. One person said that it would be what they grabbed in the event of a fire at their house. Of course, not everyone is thrilled with the curling iron. Some people have complained that the heat settings are too difficult to adjust while others have stated that they’ve had trouble using the iron itself. 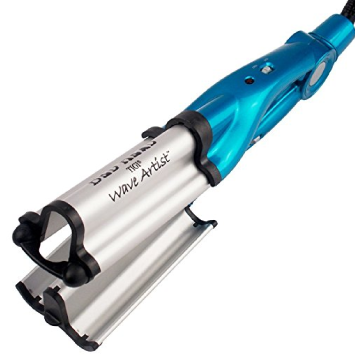 Auto rotating iron designed specifically for beachy waves. The Anjou curling iron isn’t an automatic curling iron, but sometimes, simpler is better. Although we’re reviewing the 1.25-inch model, it’s also available in 1-inch and 1.5-inch diameters. The curling iron has a Tourmaline ceramic coating that helps it heat evenly and reduces the chance that you’ll burn your hair. The coating also helps to reduce frizz. The Anjou iron also heats up pretty quickly and can reach up to 410 degrees Fahrenheit in just 60 seconds. The temperature options start at 200, which is ideal for very fine hair. For the most part, users of the Anjou curling iron are happy with it. 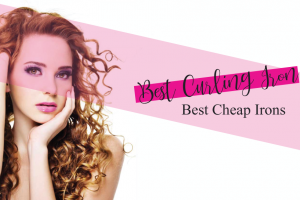 One person called it the best curling iron they’ve ever used. Others have noted that the controls are well positioned so that they don’t accidentally adjust the heat or turn the iron off while using it. Many people are also happy with how well the iron creates waves. The biggest complaint that people have about the curling iron is that it’s all too easy to burn your hands while using it because the protecting tip at the top is small. The iron does come with a heat-protectant glove, which can help to solve that issue. 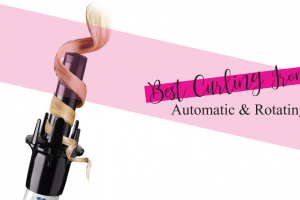 The Bed Head Curlipops Curling Wand has a lot in common with the Anjou Curling Iron. Both are 1.25 inches in diameter. Both have a Tourmaline coating. 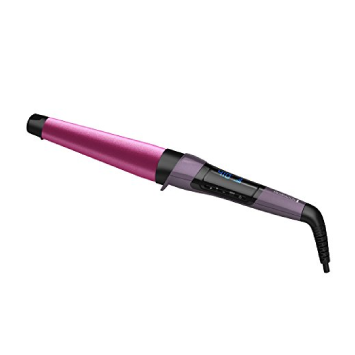 The Bed Head Curling Iron heats up to 400 degrees, which is 10 degrees cooler than the Anjou. One key difference between the two is that the Curlipops is a wand, so there’s no clip or clamp to hold your hair in place while you curl it. That can be a challenge for newbies, but it can also be rather freeing and can help you make more relaxed, beachy waves. People who have used the Curlipops have been happy with it. In fact, many people who’ve struggled to get waves with other curling irons have had success with this model. On the downside, some have noted that the heat settings leave a lot to be desired. There’s no way to adjust the temperature, so you have to put up with whatever the curling iron gives you. The Bed Head Wave Artist is a crimper, not a barrel curling iron. It’s designed to make deep waves in your hair. If you struggle with wrapping your hair around the barrel of a curling iron or have otherwise had difficulty using a curling iron in the past, this could be the tool for you. The tool has multiple heat settings and can heat up to 400 degrees. 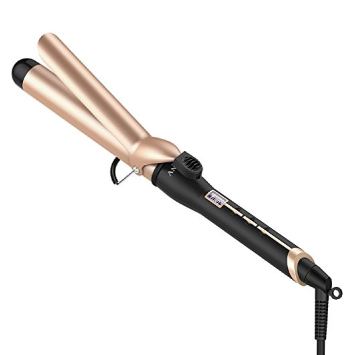 It’s also got a Tourmaline coating to help keep your styled hair smooth. Users of the Wave Artist Deep Waver have had plenty to say about it, including some tips for use. Some recommend twisting the sections of hair before you crimp them to help create beachy waves. Others recommend pulling on the hair to create a more defined wave. Those who weren’t happy with the waver complained that it gave them “crimped, Saved by the Bell” hair rather than loose, flowing waves. Others have complained about the lack of temperature reading, which makes it hard to know just how hot the tool is. Great way to get waves for inexperienced stylists. The Remington TStudio Silk Ceramic Styling wand is the only tool in our roundup that has a tapered barrel. The tapered shape can help to create volume and definition in your waves. 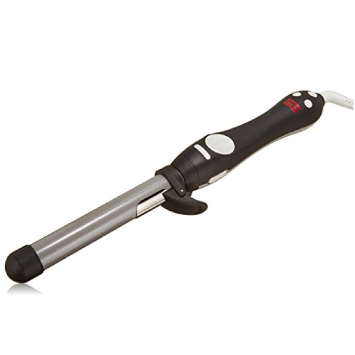 The styling wand also heats up to 410 degrees Fahrenheit and has a digital display, so you can see how hot the tool is and adjust it as necessary. It heats up in 30 seconds and has an auto shut-off feature after 60 minutes of inactivity. One additional feature the Remington tool has that we haven’t seen elsewhere is “Silk Ceramic Technology.” The coating has silk proteins infused into it, which help to extend the life of your curls. Whether that works or not isn’t clear. Those who’ve used the curling wand are largely happy with the type of waves it creates, with some calling it a hidden gem. People who aren’t so happy with the tool have complained that it’s difficult to remove the hair from the wand after curling it, causing the hair to lose its curl or wave. If your goal is to get beachy waves from your curling iron, we’ve got one tip for you: Size matters. When it comes to the best curling iron for waves, the bigger the barrel, the better. We recommend finding a curling iron with at least a 1-inch barrel, although a 1.25-inch, 1.5-inch or even 2-inch barrel can be ideal depending on the length of your hair and how wavey you want it to be. Beyond size, other things to look for in a curling iron include the range of heat settings it has and the material it is coated in. Generally speaking, you want a curling iron that has a ceramic or Tourmaline coating, which allows the iron to heat evenly. Speaking of heat, how hot the curling iron gets can make or break your style. If you’ve got thick hair, you’ll want a higher heat setting, usually at least 300 degrees. But if your hair is fine, too much heat will easily fry it. No matter what, it’s best to avoid a curling iron that doesn’t offer any temperature adjustment. You’ve probably seen curling irons out there that “crimp” the hair. Rather than wrapping sections of hair around a barrel, you place a small amount of hair between two heated, bumpy plates. You then squeeze the plates together, shaping the hair into an S-shaped wave. So, is it better to use a crimper or a curling iron if you want to get waves? The truth is, it doesn’t matter. You’ll get a slightly different shape from a crimper than you will from a curling iron, but either one will produce relaxed beachy waves. Ready to use the best curling iron for waves? Here’s what you need to do. First things first: Prep your hair. Spray damp hair with a heat protectant spray, which will form a protective barrier and reduce the risk of frying your hair. Next, use a blow dryer to dry and straighten your hair. This might not make sense, but you want to completely smooth your hair and get rid of any frizz before you make waves. Use a curling iron with a barrel that’s at least 1-inch wide if you have short hair. If you have longer hair, go for a barrel that’s at least 1.25 inches. Clamp the hair into the iron near the roots (if you’re using a tool with a clamp. Don’t twist the iron around your hair. Instead, wrap the hair around the iron until you’re about two inches away from the ends. Don’t wrap the hair all the way down to the ends that will look weird (trust us). Hold the curling iron in your hair for a few seconds, then release. Repeat with the remaining of hair. Towards the Face or Away – Does it Matter? Which direction should you wrap the hair when you curl it? Southern Living recommends alternating towards your face and away from your face to get the most natural-looking results. If you wrap each section of hair away from your face, you’ll get a more formal look. If you wrap each section towards the face, the look is more contemporary and up-to-date. Alternating directions results in waves that look natural. It will look like you “woke up like this,” instead of having spent 30 minutes to an hour styling your hair. 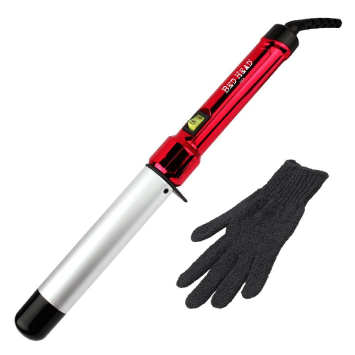 We’re going to choose The Beachwaver Co. S1 Curling Iron as the winner of our roundup. Sure, it costs more than the other models we reviewed. But it’s also the only curling iron specifically made for beachy waves. If you want the best curling iron for beachy waves, the Beachwaver is the way to go.